You are here: Home / Market Regulations / What is Dabba Trading? We often read about dabba trading, not being permitted by the regulators. Many do not know the mechanics, and also the risk associated with it, till now. Dabba means box and a dabba operator, in stock market terminology is the one who indulges in dabba trading. His office is like any other broker’s office having terminals linked to the stock exchange showing market rates of stocks. However, the difference is that the investor’s trades do not get executed on the stock exchange system but in the dabba operator’s books only. A dabba operator acts as a principal to all the trades and not as an agent of the client. He is a counter party to the trades, whereas, he should be the Clearing Corporation who guarantees trades on the BOLT/NEAT system. This kind of operation, where trade is kept within the books of the operator is called “dabba” in the popular market terms. Dabba Trading” also known as “Bucketing” is the process used by brokers to route their client’s trades outside the Stock/Commodity exchange. In such trading, the broker either does not execute any trade or matches and execute trades on its own terminal. “Dabba” has its origin in the developed markets where a system called bucketing prevails. Bucketing is an illegal practice where a stockbroker executes a customer’s trade without taking it to a stock exchange with the hope of making some gains at a future date. essentially, bucketing involves the confirmation of an order from a client without actually executing the order on the client’s behalf. The anticipation is that the broker will be able to realize enough profit to offset the difference to the client at a future date, either due to executing the order at a later date or through profits generated on other transactions. The broking house that engages in this activity are called bucket shops. Dabba trading operates essentially like the American bucket shops of the 1920s that existed before the Securities and Exchange Commission (SEC) was set up. A Dabba operator flouts rules and regulations relating to Client Protection,which includes registrations, margins, transaction, execution and settlements. Not only he evades the Income tax regulations, which prohibit dealings in cash, but also service tax rules requirements. It may be learnt that the Securities Contract Regulation Act permits securities transactions only through stock exchanges unless the settlement of the trade is done on a spot basis i.e. the receipt and delivery of shares happen within 24 hours of the trade. But a dabba operator allows the client to carry forward the trade, be it in cash or in derivative segment for a period, not necessarily prescribed by the stock exchange. The cash trade is not settled on rolling basis and the derivative trade may not have a month-end settlement cycle. In dabba trading, most of the times, neither written contracts are made, nor the bills are issued .The settlement cycles are authorized by the dabba operator, himself. There is no daily mark to market settlement if the trade is in client’s favour, whereas losses are extracted regularly from the clients. This presents before us the picture of an outlaw practicing amidst us, the organized price discovery mechanism of stock exchanges to run an illegal business, while maintaining the façade of a stock market broker. It is a criminal offence, not much different from smuggling or black marketing. As a result, frequent raids are conducted on dabba trading operators in which their computers and records are seized. Those working in his office are also taken in the custody just like drunkards found in the illegal toddy shop. The Gujarat police has conducted several raids in the past and alerted citizens. Media has also played its role in reducing the menace of dabba trading. Some dabba traders hedge their positions in the market by partly executing the trade in the market, maybe in their own proprietary accounts or some benami names. Dabba traders disappear when the market goes against them, resulting in huge losses for their clients. The brokers who permit such activity in their branches or even sub-broker’s offices are the affected parties. Stock exchanges take complaints against dabba trading very seriously and enforce strict penalties. Even suspension is levied, if stock exchange inspections confirm the complaint. s Sensex jumps, resulting in the spurt in trading activity, dabba traders bounce back in the business. Hence constant vigilance is required. Most important, people should not patronize such traders. The clients patronizing such dabba traders may find some short-term benefits here. They do not follow ‘Know Your Client’ norms; fill cumbersome forms, sign long agreements and requirements like PAN card. Margins are bypassed and leveraging is freely available. Unaccounted cash is used for making payments rather than making payment by cheque. It must be understood that dabba traders are fair weather friends. They seldom honour their commitments, particularly when market is against them. Dabba shops close overnight, with traders disappearing from the locality. They go to the extent of employing goons for the recovery of losses. In such a case, neither Stock Exchange Arbitration is available to the investor nor there is any access to customer protection funds. The Security blanket provided by the Security Market Regulations is also not there. Concerned over growing illegal futures trade in commodities, the sector regulator Forward Markets Commission (FMC) has started holding training programmes for police forces across states where such trading has proliferated. According to the industry estimates, the size of illegal futures trade (also known as ‘dabba trading’) in commodities is expected to be up to Rs 3,00,000 crore a day in the country. In India, Gujarat and Uttar Pradesh are two main centres for dabba trade. As if dabba trading in stocks and commodities was not enough, punters in Rajkot and other part of Saurashtra have even started foreign currency trading. Foreign currencies such as the Euro, pound, yen and Australian dollar have become the hot favourites of this market which has a daily turnover of Rs 100 crore. In a recent incident, a dabba trade racket in menthe oil was busted at Chandausi in Uttar Pradesh. 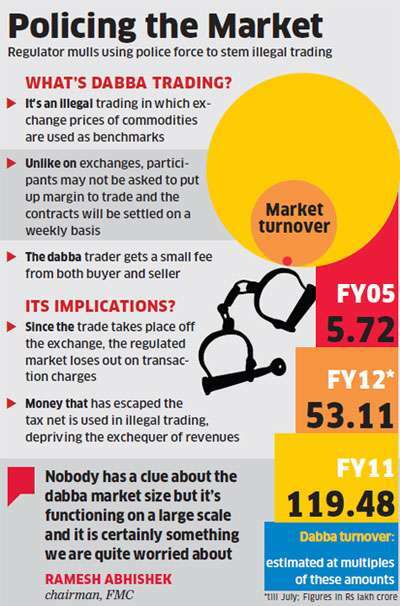 In fact, the unofficial dabba trade in Chandausi is believed to have driven away mentha volumes, by as much as 80% since last year, from two of the online national exchanges — MCX and NCDEX. Trades have also been reported from other mentha growing areas in UP like Sambhal and Rampur. Mentha oil has always been a speculators’ delight and in the past even some big stock market players have played the Futures on the official exchanges. Despite the risks, dabba trades are generating volumes of three to four times the combined turnover in both the exchanges. THE INFORMATION GIVEN BY YOU WILL HELP ME IN FUTURE ALSO INCREASES MY KNOWLEDGE. I have been duped and cheated by ZOIDRESEARCH. who has been continuously asking me money for operators. till now, 3,33,468 has been paid and they are still asking for more money. I read about your posts and I am repenting now. there are millions of other users as well who are in their trap. you can visit their website, zoidresearch.com. I require your urgent help as to how to recover the precious money from them . Please help.i also have all the receipts with me. guide me as to how to teach them a lesson. let’s come forward. Information is very helpful. I also trapped in Dabba trading and they shown loss of 80000 in one day and 2nd of trading with them and they are continuously calling and saying to fulfill this amount rather than result will be very bad..now I am asking them to send your pakka bill or your office address but they are nothing sharing information.now how to fight with them I dont want to pay because I already told them I don’t know what is Dabba trading..now plz suggest me can I file a case in Cyber crime? I already told my nearest police for this issue. I am in lucknow uttar pradesh,a mcx member ia duping people here and from the initial starting he is doing only dabba trade,no bills,no contract notes. Today I received s call from Dabba they asked me to invest in Dabba .thank God I just visited Dabba in Google search. I found it is illigel and I also came to know it is fake.I read many comments regarding Dabba.